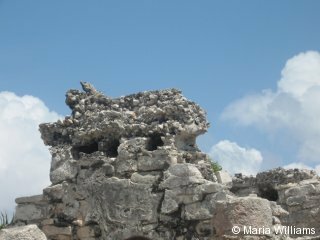 Once home to the ancient Mayans, archaeological zones and pieces of history are scattered throughout the Yucatan region. 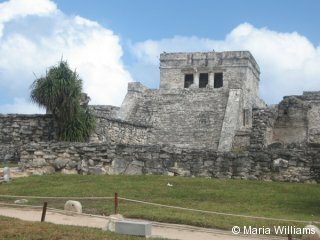 When we arrived on land, we immediately boarded a bus to visit one of these intriguing sites. En route to the Ruins of Tulum, our guide told us more about the Mayans and their culture. 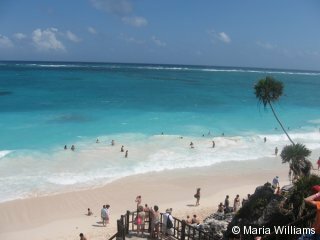 Situated atop sea cliffs that are nearly 40 feet above the sparkling Caribbean water, Tulum once served as a popular Mayan marketplace and an important commerce center. Known as ‘the walled city’, an impressive 16-foot wall surrounded the landward side of the village and provided an effective defense system. The architecture and structure of the ancient city was truly amazing! 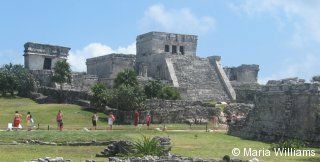 El Castillo is the most prominent structure in Tulum. 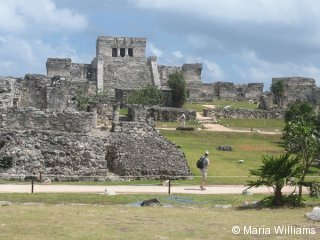 Sitting on the edge of the steep cliffs, El Castillo is similar to other Mayan temples but also resembles a fort when it is viewed from the back side. The open windows across the back may have served as lookout points to protect the city from a sea invasion. The time and attention to detail that went into the construction of the structures is unbelievable! Forgotten murals give a glimpse into life during the Mayan Civilization. Intricate carvings still adorn the structures and columns, and are evidence of the remarkable craftsmanship that abounded during this era. The tropical paradise below was just as awe-inspiring! We enjoyed the panoramic view. The turquoise Caribbean water gently danced across the warm white sand, as the palm trees swayed in the breeze to the same rhythm – a truly beautiful place. No wonder so many of my paintings are inspired by scenes like this! 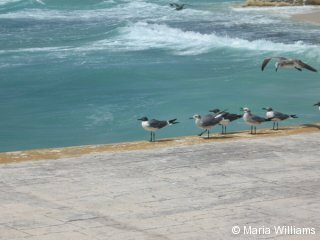 My trip to the Yucatan Peninsula was a remarkable experience! 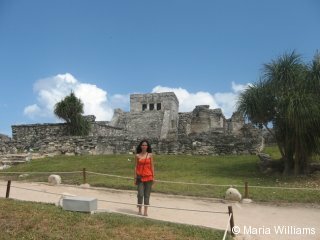 I really enjoyed learning more about the Mayan Civilization and I had a wonderful time exploring the ruins at Tulum. Before we left, we visited a nearby marketplace and browsed the handmade creations of local artisans. 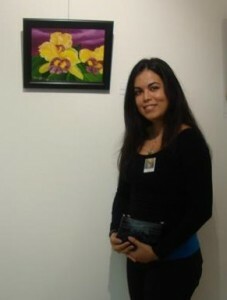 Most of their work was influenced by the Mayan culture and was extremely unique. My favorites were the jewelry pieces made using the Mayan alphabet!